These were certainly a staple in our house growing up. Mom could whip up burritos for a quick and easy weeknight meal and it was something that we all loved. I always remember her making up extras to toss into the freezer for dad's lunches. Or something simple for us to reheat as we got older and were allowed to operate the microwave. Now I find myself making these for my own family, usually for just the girls and I because Josh doesn't like beans. And just like mom, I always make sure to add at least a few extras to the freezer. 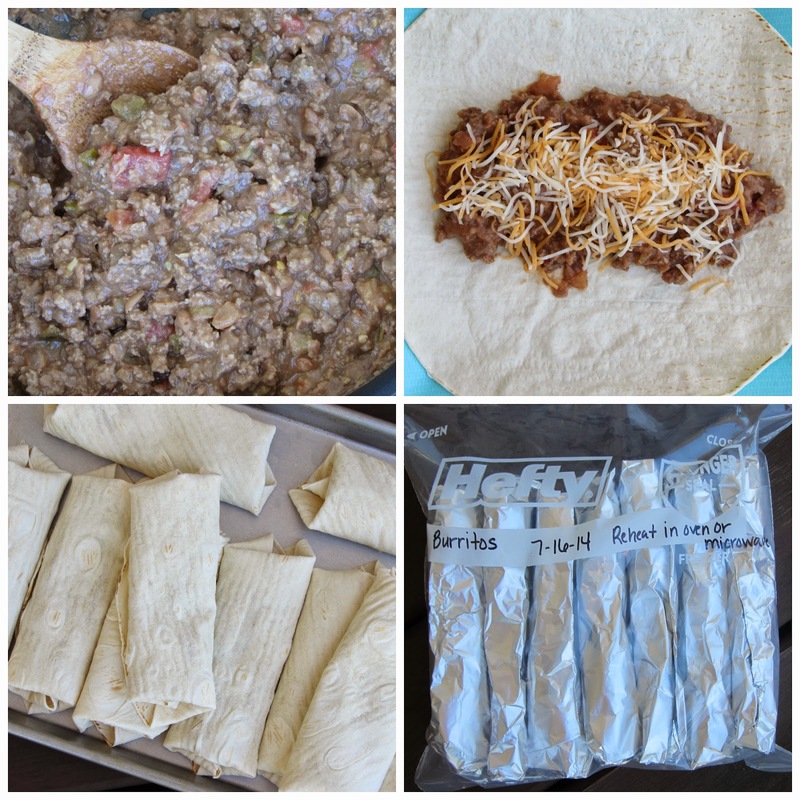 Burritos are a very simple and versatile dish to make ahead. Ground beef is our favorite but using shredded chicken breasts would also be good. I like using my homemade refried beans instead of store bought, just because I get more for my money and they taste better. If you have access to a microwave for lunch, I highly recommend you consider these. I was able to make ten burritos out of one batch, one would be plenty for myself at meal time. Pretty frugal if you ask me. Brown ground beef in a large skillet until crumbled and no longer pink. Drain grease well from pan and return cooked hamburger to skillet. Add in beans and salsa, stir well until combined. Let cook for a few minutes over low heat until everything comes together. Remove from heat. Divide mixture among tortilla shells, placing right down the middle of the shell. Sprinkle with cheese and roll up burrito style. Burritos should be pretty well cooled by this point. To prepare for freezer: wrap each burrito well in foil. Then place into a large freezer bag that has been labeled and dated. Place bag in freezer until ready to use. When ready to enjoy, remove from freezer and let thaw. You can warm in microwave for a couple minutes. Or I like to heat mine in the oven for about 10 minutes so it gets a little crispy. Serve with additional salsa if desired.